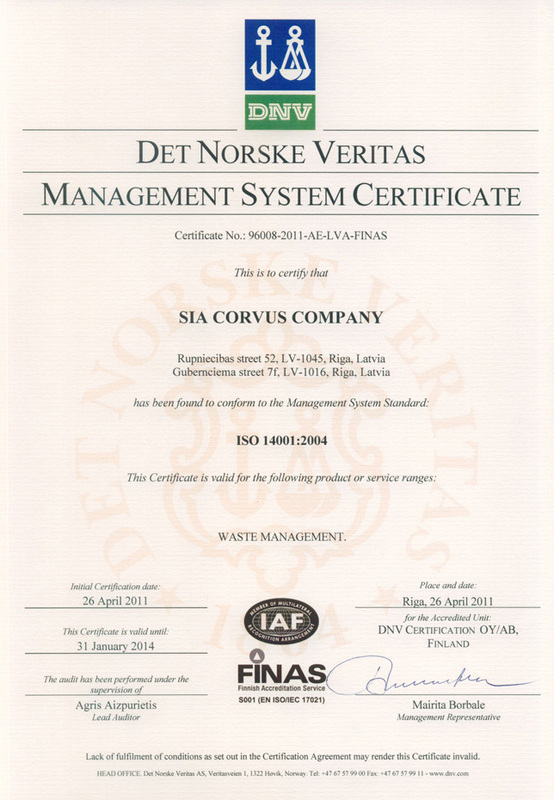 On April 26, 2011 «CORVUS Company» has received a certificate Nr.96008-2011-AE-LVA-FINAS corresponding to ecological management system ISO 14001:2004. The conformity certification has been issued by an international certificating organization Det Norske Veritas. Specialists from Det Norske Veritas have highlighted the following strengths of CORVUS Company: management system: responsibility of managing persons, management system efficiency, products distribution planning, continuous improvement, monitoring and assessment of processes and ecological impacts, risk management measures, in-house auditing, competence, staff training and knowledge, emergency readiness planning, software implementation in management system, infrastructure and production environment. СCertificate ISO 14001:2004 approves that our ecological management system at an enterprise has been assessed and conforms to the standard. ISO 14001:2004 is and international standard summarizing modern world experience in environmental management. The main objective of the certification for correspondence to international standards of ISO 14001:2004, eries is protection of environment from impact of external economical factors and improving environmental condition by preventing emergency situations. Environmental management system development and implementation by companies in accordance with international standards ISO 14001:2004 is a guaranteed way to success in their activities at home and international markets.